This is a total vanity post. 🙂 unSeminary has just passed the 300 article milestone and so I thought I would take time out to reflect on some of the lessons that I’ve learn through this journey. 70 / 20 / 10 // I’m inspired by Jonathan Mann – “The Song a Day Mann” – who produces a new song every day … 7 days a week … and has been doing it since 2009. His content production schedule is breath taking. [Check him out on YouTube.] He says that about 70% of his posts are mediocre … 20% are terrible … and only about 10% of them are great. [He explains this here.] He says that ratio doesn’t really change whether is writes once a day, once a week or once a month. So for him to get to 3 good songs he needs to write 30 songs! I think that ratio is about right with my blog posts too! Just writing and pushing forward is what has made the difference for me … committing to a schedule and cranking content has been valuable. Surprises // I can’t always predict what helps church leaders. Because I have myself on a bit of a content treadmill there are times that I really have no idea what to write on … so I’ll just start writing. Some of those posts have proven to be the most helpful for people. My most read post – “7 Reasons Your Church Should Stop Buying Apple Computers and Move to Chromebooks” – was an example of that. I woke up that morning and was sitting at my computer with no ideas on what to write. I literally started typing about the Chromebook I was using that day just as a task to “just start writing” and it turned into that post. In the end, that post was read about 30x more than an average post! On the other end … there are times that I think people are going to pick up on an article and it goes nowhere! Love the Community // It’s humbling to me that literally thousands of people have subscribed to unSeminary Inbox … we deliver a week’s worth of posts every Friday morning. People are so incredibly encouraging to me every week as they thank me for what we do here. They share with me what’s happening at their church … we pray together over issues happening in their community. What started as a strategy to help make it easier for people to read the content I produce has blossomed into a community that I connect with regularly. I know that it’s a big deal that people “let me into their inbox” … I take that responsibility seriously. I’m thankful we have this connection! Podcast has been fun! // In September 2013 I launched the unSeminary podcast and I love it! Every week I get to talk with fascinating church leaders about what is happening in their community. We try to focus on content that church leaders can put into action right away. The stats show that this has reached a whole new group of people … which is so encouraging! If you aren’t subscribed to the podcast … I’d love you to! This post got picked up by Google+ and was listed on a “What’s Hot” list inside Google … so it received a bunch of attention even out side of the unSeminary community! I have a passion for helping people who are new to the church feel like they are welcome. I love that people seem to resonate with the content in this article … and I’ve heard from multiple churches who have implemented some of these ideas in their church. Love it! Announcements … can’t live without ’em … nobody seems to love ’em! I get a kick out of maximizing this part of our service … rather than seeing this as a “bore” or “hassle” … I think we can use this time to move people to action. I think the title for this post is too ambiguous and the writing is pretty bad. I still like the idea being expressed here … but I just didn’t get it across in a clear manner! This post was from my early days and breaks my “rule” of “always helping church leaders.” There is nothing “helpful” about this article … people don’t walk away with something they can actually do to be better at their church. The stats on this post are so painful … rightfully so … I wasn’t helping anyone with it! Dive deeper into new topics that are designed to help your church … rather than just skimming the surface we will dive deep with lots of practical help and done-for-you resources. An opportunity to go 1on1 with “industry leaders” … rather than just listening to keynote speakers or wishing I would have asked someone a question on a podcast … you’ll get the chance to talk directly with innovative church leaders making a huge impact and they’ll be available to help you with your church! Increase the conversation amongst the unSeminary community … there are some amazing people who follow unSeminary. You really should talk amongst each other more! I know there are solutions to the problems you are facing in the other people who gather here regularly. And a few other surprises … that we’re cooking up. It’s going to be great! I appreciate you being along for this journey. Thanks for taking time out from your busy ministry to be a part of the unSeminary community. I want to steward your attention well and see you make an impact in your church. I’m thankful that you’ve chosen to give unSeminary some of your attention. I also want to thank my wife – Christine – and my kids – Haley and Hunter. unSeminary is a side-hustle … I write these posts in the early morning or late at night. They give me the space, opportunity and encouragement to make it happen. Christine is an incredible woman … I still can’t believe she chose me. 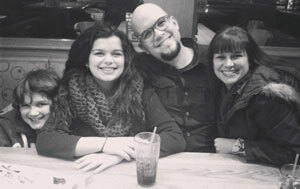 My kids are amazing people … I love watching them grow up into world changers. Thank you guys! Love the stuff you produce and I’m really looking forward to what’s coming up! Thanks for being super-humble and putting yourself out in order to help church leaders! I’ve learned a tonne from you! Blessings! Thanks for your kind words! I appreciate that. Pumped by what is happening at Portage! There’s some cool stuff happening, for sure! Would love to connect as things continue to progress. Looking forward to whatever you’re cooking up! Thanks for all the in sigh Rich. Always helpful and nice to have a guy in the Google tech camp. Helped me convince our ream of chrome book. Looking forward to what you have coming up. I’ve got my ideas and looking forward to see if I’m right. Thanks for the encouragement Ryan! How is the Chromebook working out? I had to swap out my 15 month old one today … kinda drove it into the ground. It was so fast to switch to a new one … two minutes tops! Thanks for being along for the journey … so pumped for what’s coming up! I’ll let you know as soon as I get it. Just ordered the new dell. Have a nexus 7 for my running around Sunday responsibilities. Hoping to be some good distance out of it. I’m sure there will be a couple things I miss but overall I do 98% of thing cloud or Google based anyway. Gods up to big things our way as well! What’s the new chrome book you ordered? Your ratio is much better. One cavil: in your least-read section, what happened to #299? Friction … Friend or Foe in Church Communication?